In 2000, His Highness the Aga Khan initiated a programme to establish an integrated network of schools, known as Aga Khan Academies. The aim of the Academies is to provide education to deserving students at an international standard of excellence. In 2003, the first of the Aga Khan Academies was established in the Kizingo area of Mombasa, Kenya. The Aga Khan Academy Mombasa is a state-of-the-art learning institution recognised as an International Baccalaureate World School. The campus design was inspired by Swahili architecture. Our campus sits on an 18-acre piece of land that includes a residential facility, a sports complex, classrooms, resources areas and common areas. The Academy was inaugurated in 2003 as a day school by His Excellency Mwai Kibaki, the President of Kenya, in the presence of His Highness the Aga Khan. The residential programme officially began in April 2009. We pride ourselves on having a multicultural student body, which excels not only in academic pursuits, but also in sports, cultural activities and community initiatives. Our programme has already proved successful, with our students achieving strong academic results. In 2007, we saw our first International Baccalaureate Diploma graduates obtain acceptance as well as scholarships from top post-secondary institutions worldwide. The Aga Khan Academy Mombasa will be part of a network of approximately 18 planned Aga Khan Academies that will form an interconnected learning community. 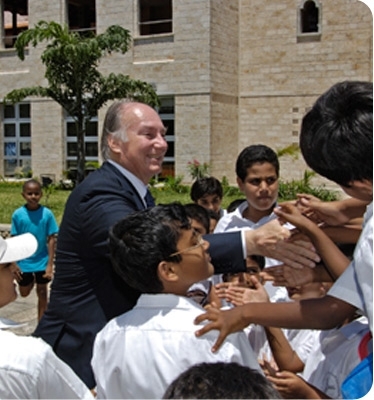 The Aga Khan Academy Hyderabad, India was the second to open in 2011, and the third opened in 2013 in Maputo, Mozambique. Others are at various stages of planning and development (map). The work of the Academies is also enhanced through partnerships with other international educational institutions. These include the International Baccalaureate network, the Aga Khan University, the University of Central Asia and other agencies of the Aga Khan Development Network.